Chinese mobile phone maker Huawei has officially announced plans to make its Ascend Mate phablet available for purchase in the local market with a price tag of 2,688 Yuan attached to it ($430 / 335 Euro). The smartphone is set to hit shelves in the country on March 26, the mobile phone maker said, adding that it would be released through Huawei's Vmall online store, Engadget reports. The Huawei Ascend Mate was made official at CES in January with a 6.1-inch touchscreen display, a 1.5GHz quad-core HiSilicon K3V2 processor, and 2GB of RAM. Furthermore, the mobile phone sports 4GB of internal memory, a microSD memory card slot, and an 8-megapixel photo snapper on the back, while being powered by a large 4050 mAh battery. 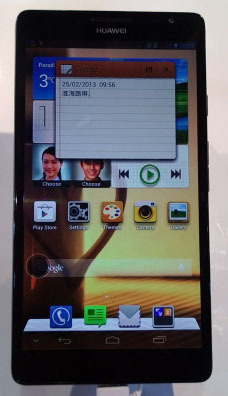 Huawei Ascend Mate runs under Google’s Android 4.1 Jelly Bean operating system and will arrive on shelves in China with support for WCDMA 850/900/1700/1900/2100 frequencies.